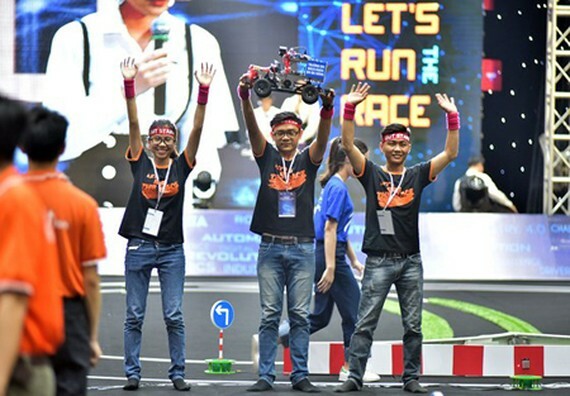 Eight best teams from six universities nationwide took part in the final round of the Digital Race 2017-2018 held in the stadium of Tay Ho District in Hanoi on May 17. At last, the team UET Fastest from the Vietnam National University-University of Engineering and Technology (VNU-UET) was crowned the champion. Winwin Sprial from FPT University won the second place, followed by the two teams of MTA_Race4Fun from the Military Technical Academy and Prototype of FPT University. This is the second time Digital Race has been held, both by FPT Corporation. The eight teams entering the final round are from FPT University, the Military Technical Academy, the Vietnam National University-University of Engineering and Technology, Da Nang City University of Technology, Ho Chi Minh City University of Technology, Vietnam National University-University of Information Technology Ho Chi Minh City. After six hard-working months of practicing and competing, all members of the teams step by step overcame technological challenges of creating a self-propelled vehicle, including basic knowledge on image processing, artificial intelligence, as well as hand-on experience on car models that are one-tenth the size of real cars. In the final round, vehicles of all teams are able to move on routes with complicated surfaces having obstacles and traffic lines. They can also turn left and right or stop in accordance with traffic signs, which are randomly changed after each turn to ensure the fairness. As the winner of the Digital Race 2017-2018, the four members of UET Fastest received a scholarship worth VND 450 million (approx. $19,750), including a one-week tour around Japan. They will also be granted a position in FPT Software. The Digital Race has been held by FPT Corporation since 2016, focusing on cutting edge technologies in the world such as robot programming, voice operated control, artificial intelligence. The Digital Race 2017-2018 attracted nearly 800 participants in 260 teams from 32 universities nationwide. 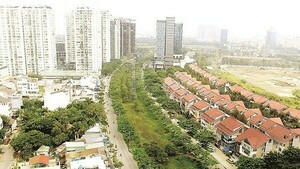 Ho Chi Minh City has the most registering teams (117 teams), followed by Hanoi with 102 teams and Da Nang City with 41 teams. The total worth of all prizes is around VND4 billion ($175,552). Representatives of the Ministry of Science and Technology, the Ministry of Information and Communications, and many enterprises attended the final round event.